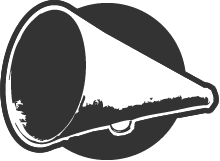 We are the megaphone through which our public relations clients are heard, their stories told. The television reporter and his videographer had just wrapped up an hour-long visit with one of our clients. As we shook hands and thanked one another, the reporter noted the value of the news release we had sent relative to their coming out for this story. “Your press release was right to the point and just what we needed,” he told us. We’ve heard that many times through the years. These tools make it easier than ever to tell one’s story to a global audience. Yet what seems so close can be so far away when you consider how many people and organizations are trying to get their slices of the pie.